Can I be baptized at your church? If I’m already baptized in another denomination, do I have to be re-baptized? You can be baptized by water and the spirit after instruction in the meaning of baptism. 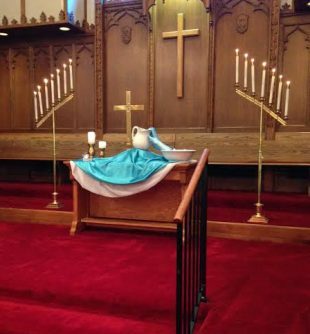 The United Methodist Church practices both infant and adult (believer’s) baptism through immersion, sprinkling, or pouring. We also practice Confirmation when a person who was baptized as an infant may affirm the vows of baptism, become a member of the church universal, and commit to membership in the United Methodist Church, and a local congregation. If you’re transferring membership from another congregation–Methodist or otherwise–you do not have to be baptized again. For more detailed information on baptism, visit the website of the United Methodist Church. Must I be baptized to marry in a Methodist church? No. Methodist pastors, typically, are happy to officiate at inter-faith weddings which could not require baptized participants. Personally, I wouldn’t ask. How can I get baptized if I am in a wheelchair? We will baptize any body in any way that works. For someone in a wheelchair, sprinkling would probably work best. Do you do baptism by immersion? Sometimes! Can I be baptized if I’m a non-member? Yes. What’s a customary payment for baptism? There is no payment or fee required for baptism. Baptism is a sacrament and means of grace. Grace comes from God and it’s free. How can I be baptized Methodist? Let someone in church know that you want to be baptized. We believe one is baptized into the community of faith. Baptism is meaningful because of the commitment to and the living in the Body of Christ here and now. I hope when you are baptized (whether as a baby or an adult) that you take seriously and happily the life of discipleship. We live as disciples of Christ together—in community. I’m interested in baptism for myself and/or a family member. What’s the next step? Contact Pastor Leah at leah@northeastumc.com or 612.789.7462. 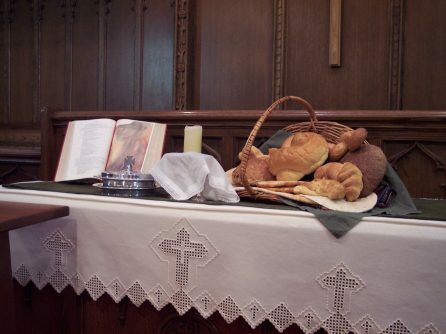 Can I take communion if I’m not baptized? Yes. I still have questions about communion. Who do I talk to? Contact Pastor Leah at leah@northeastumc.com or 612.789.7462.